The meeting between Pak Lah and the Venezeluan President Hugo Chavez commences today, our main objective is to strengthen the bilateral relations between the two countries and I could see that the latter's country is going to be one of the backbones of Malaysia international trade; having 77.2 billion barrels of proven conventional oil reserves and the Venezuelan state-owned company Petroleos de Venezuela S.A. (PDVSA) estimates that the Orinoco Belt, a territory which occupies the southern strip of the eastern Orinoco River Basin, has 236 billion barrels of heavy crude, which would make it the largest petroleum reserve in the world. 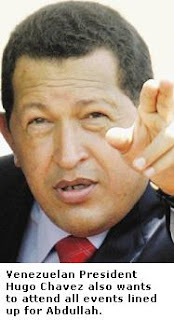 Chavez's industrial policy in 'not to look upon' the Bush's dirty hands, shall remain, hitherto and in the future. The support from each of one you is the driving point that leads to a mountain of successful innovations for the positive openness in the world of ICT in Malaysia.